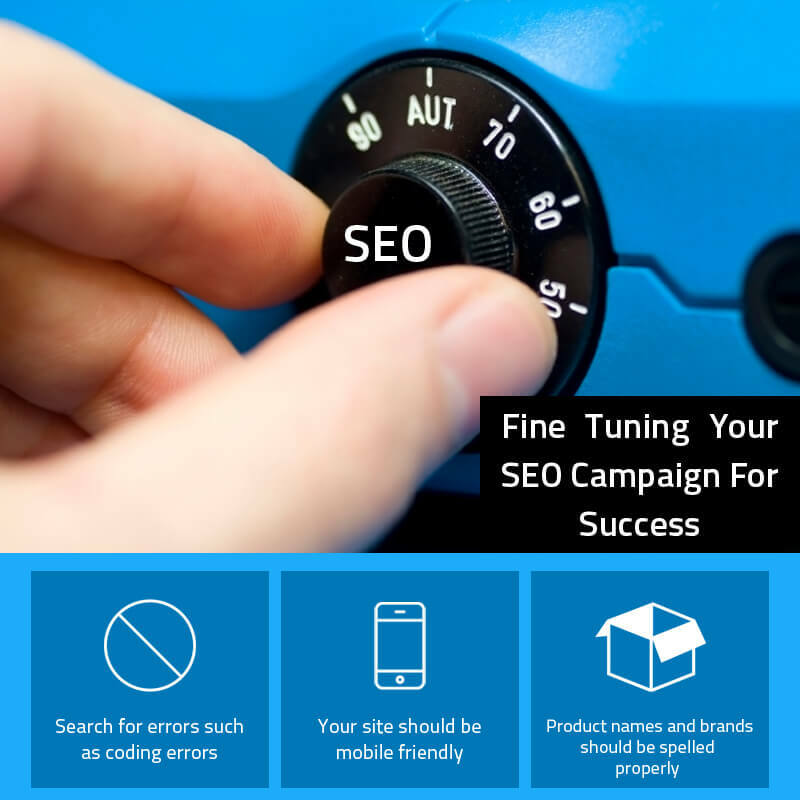 SEO calls for some fine tuning along any point of the process. After establishing a solid foundation, one must then tweak and fine tune things for greater efficiency and equability. Basically, to fine tune or tweak calls for firstly, a good and objective analysis of one’s site overall. Search for errors in design or content such as spelling errors and coding errors. Especially make sure product names and brands are spelled properly and that your site is mobile friendly efficient. There is no substitute for good mobile web design. Mobile is ruling the world at present. Make certain to have a full knowledge of mobile SEO or hire someone who does. To fail here is to fail overall. Check video, graphics, pictures for errors as well. Make sure they’re properly tagged and described. Take a look at such content to see if you can spice it up, make it more pertinent or festive. Make people ‘want’ to return to your site to see what is next. You want that return traffic as it shows the search engines that your site is favored and of some value to the average surfer. This means that when surfers are looking for something, your site will move to the higher rankings as the search engines will see your site of greater value than the competition. The old days of hyper-SEO with ‘Black Hat SEO‘ techniques are over. Those sites are rapidly dwindling on the search engine results because the new algorithms look for such things, invalidates them or penalizes them. You do not want to be penalized by Google. It could be a website’s death knell. Local SEO is of major importance here. People can’t buy from you if they don’t know where you are. People searching for your services or goods in your area need to find your business, but if your website has 50 webpages but only 1 page has your contact location info, then you’re at a loss. Google indexes webpages, not websites. Each web page on your site should spotlight not only your goods and services, but also your contact information. In social media exchanges, your location should be included. The same goes for message board and Facebook posts, Instagram and Twitter posts and so on. Getting that quality content. Content is still king but quality content rules. Your site has to stand out among the competition. Starting with a great and eye catching design and navigation, one’s copy, pics, videos, graphics, blog posts, should be entertaining and informative. People should be coming back to one’s site regularly, bookmarking it, sharing the url with friends, chatting about it on social media and more. That buzz puts your url out there, your location and type of business in the public eye. It can snowball to a great amount of organic traffic which can be exploited for greater equity. Thus, take an objective eye to one’s website content. Is it presented legibly? Is it informative and entertaining? Does it call for action from the surfer? If not, make it so. If you have to hire an expert in copy writing, then do so. Check your stats and metrics to see what content is being shared or linked to, and do more of it. Updating your site and blog are a key component to making your site look live and fulfilling. A website shouldn’t just sit there and gather dust. It has to vibrate, show some life, and be Seed’s for the utmost gain. Take the time to critique one’s website and get opinions from others. Chat with an SEO expert and follow their instructions to better the site. It will be of benefit for the short and long term.